Morning all! Who’s feeling Christmassy? I know I am because I have started to panic about getting presents in time…I can’t seem to get myself in gear until December and then it arrives and I panic! Not to worry, as I have a soothing facebook giveaway over on the Mum’s Days Facebook Wall today! 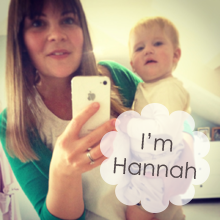 I got chatting to The Soother Company a few weeks back about Footmuffs of all things! And, the subject naturally progressed onto Soothers, since that’s what the company is called…! They sell so many cute, personalised soothers, I’m just gutted Reuben never took to it (despite me really trying!). We decided, since we’re both feeling festive (! ), we would do a joint Facebook giveaway to celebrate. How cute are they? The soothers can be personalised with whatever you want too! 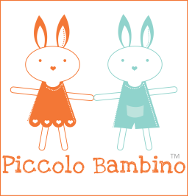 Then go over and say hello to The Soother Company and be sure to Like their page too! 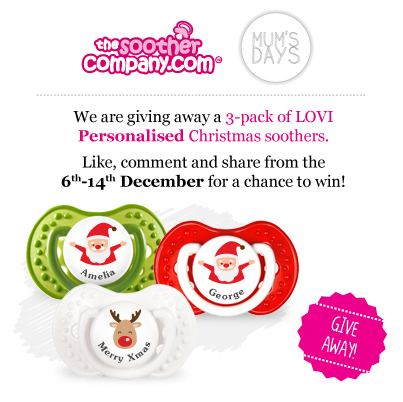 1 set of 3 Personalised Christmas Soothers are available to 1 lucky winner. The winner will be announced on Saturday 14th December at 12pm so please look out for a Facebook message from me, Hannah Parker, in your “other” folder. You will need to tell me as soon as possible what text you would like on your soothers to be sure that we can get it to you in time for Christmas. The soothers can be personalised with ONE message up to 10 characters long. Please be very careful when writing the name or phrase as we cannot be responsible for spelling mistakes! The competition is only open to residents of the UK and Ireland.